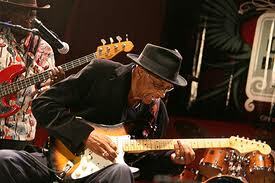 I just learned via a tweet from Hot Tuna guitarist Jorma Kaukonen that blues guitar great Hubert Sumlin passed away this morning, succumbing to heart failure at a New Jersey hospital at the age of 80. The Mississippi-born Sumlin is best known for his work in the ’50s and ’60s with blues legend Howlin’ Wolf. Some of the deathless Wolf tracks that he played on include “Killing Floor”, “Smokestack Lightnin'”, “Spoonful”, “The Red Rooster”, and “Howlin’ For My Darling”. Sumlin also recorded under his own name, his final album being 2004’s About Them Shoes for the Tone-Cool label. He was inducted into the Blues Foundation Hall of Fame in 1988, and was recently listed as number 43 on Rolling Stone‘s 100 Greatest Guitarist of All Time.